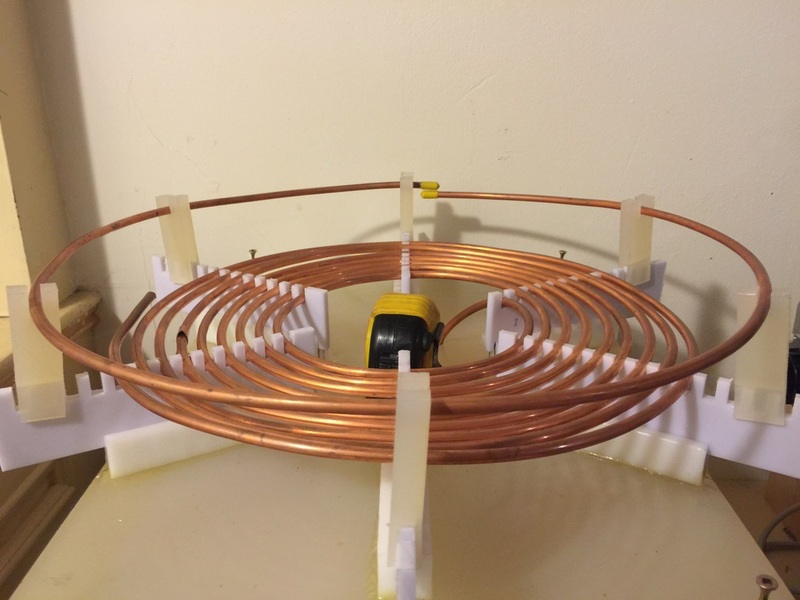 2800 turns of 30 gauge copper wire with polyimide insulation. Wound using a lathe (thank god for a lathe). 3 coats of oil based marine varnish applied over 24 hours (a bit of a rush). 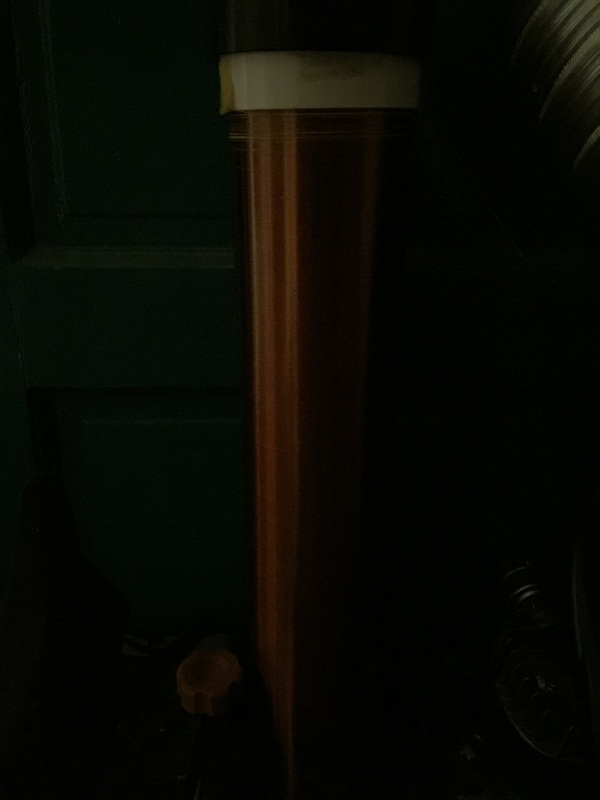 The inner core is a 4 inch PVC pipe. 1/4" refrigeration tubing. The topmost loop is a strike coil. The gut of the tesla coil. 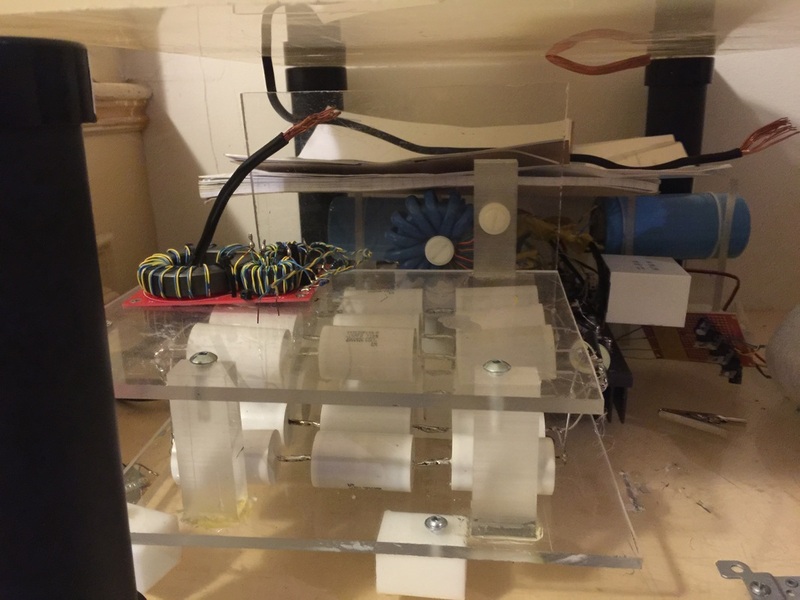 Shown here is the capacitor bank encased in plexiglass boards, current transformer (the two black ferrite cores with yellow wires), gate drive transformer (the one with big blue wires), power supply bus capacitor (the big blue can), and snubber capacitor (the white rectangular capacitor). Not shown here is the full bridge of IGBT on a huge heat sink (they're behind the capacitor bank). The singing tesla coil actually produces music in a similar fashion as musical instruments, in that there are distinctive frequencies (notes) that are played. However, due to the constraints of the electrical system (the particular type of driver is known as dual resonant solid state tesla coil DRSTTC), only few notes can be played at once (ideally monophonic) in order for the driving IGBTs to not overheat. I used some free MIDI creation and editing softwares to convert a full spectrum wav audio file (regular music) into MIDI files. This is known as musical transcription, which basically performs a FFT on the input. The MIDI file is then sent through a USB to serial converter and enters the interrupter circuit. The interrupter basically "interrupts" a resonant train of sinusoids (tesla coil) via square waves that are the exact same frequencies as the note that should be played. Typically, the resonant frequency is around 100 KHz, whereas the interrupter frequency (musical notes) is between 200 to 2000 Hz, and the resulting waveform is a low duty cycle (typically less than 2% duty) pulse train of sinusoids. The interrupter sequentially takes input from the serial port and outputs the interrupter signal to the main IGBT driver.